What is Azure Monitor for VMs (preview)? Azure Monitor for VMs monitors your Azure virtual machines (VM) and virtual machine scale sets at scale. It analyzes the performance and health of your Windows and Linux VMs, and monitors their processes and dependencies on other resources and external processes. Pre-defined trending performance charts: Display core performance metrics from the guest VM operating system. Dependency map: Displays the interconnected components with the VM from various resource groups and subscriptions. 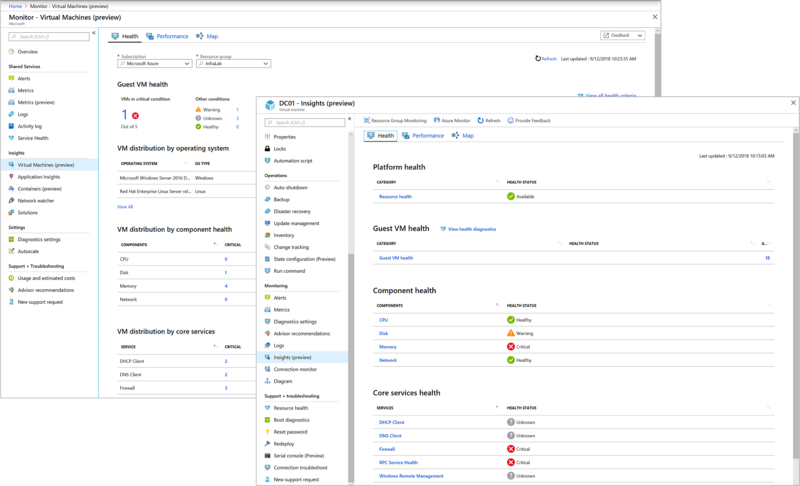 Currently, the Health feature is offered only for Azure virtual machines. Performance and Map features support Azure VMs, Azure VM scale sets, and virtual machines that are hosted in your environment or other cloud provider. Integration with Azure Monitor logs delivers powerful aggregation and filtering, and it can analyze data trends over time. Such comprehensive workload monitoring can't be achieved with Azure Monitor or Service Map alone. Health: The VMs are related to a resource group. Map and Performance: The VMs are configured to report to a specific Log Analytics workspace. Azure Monitor for VMs can deliver predictable performance and availability of vital applications. It identifies critical operating system events, performance bottlenecks, and network issues. Azure Monitor for VMs can also help you understand whether an issue is related to other dependencies. The data that's ingested and stored. The number of health criteria metric time-series that are monitored. The alert rules that are created. The notifications that are sent. To understand the requirements and methods that help you monitor your virtual machines, review Deploy Azure Monitor for VMs.